My parents were health & temperament tested. My breeder studied pedigrees for a very long time. My breeder fed my parents a healthy diet. They had me in their thoughts & loved me. 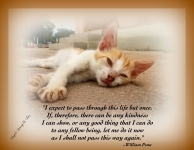 I was born due to much planning & care. champions. We still are showing them, to a bit lessor degree. of colors and sizes. 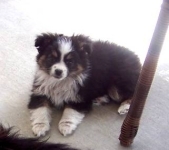 We had a litter of Mini Aussies in 2009, our first litter in 16 years. program specializing in this size, up to 14". Most will be smaller. Toys are 10"-14". firsts, and two group seconds. 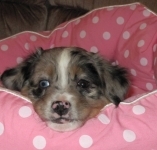 Please check our puppy pages to see what we have to offer to great homes. 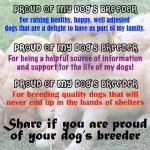 only a few dogs and are proud of them and what we have produced. is hard to be exact as to adult size. We try our best in the mature size of your puppy. who could resist this lovely puppy??? We are located in western New Jersey. We are proud memembers of ASDR ,TASAA, IABCA,NAKC (formaly Rarities). Never be afraid to try something new..